This tutorial uses the Clip Transition menu to create a graphics transition, or ‘Replay Wipe’, ‘SloMo Wipe’ etc. Plus a macro to automate the transition with a single button-press every time. I’m using the P/P bank. The key priority is normal – i.e. keyer 1 is the bottom of the stack – priority 4. 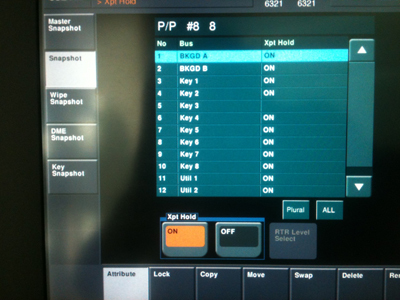 Keyer 4 is top of the stack – priority 1. The animation is keyed on DSK3, from Frame Memories 7 & 8 – fill & matte respectively. The Clip Transition operates on DSK2, with M/E2 as the key video, so that it wipes to the replay keyed over on M/E2, whilst the director can continue to cut cameras as normal on the PGM bus underneath the replay (the typical Sports Replay wipe). DSK1 is available if I need to transition from or to a composite with graphic. DSK4 is available if I need to key a graphic over the top of the replay etc. First, recall the graphics clip into FMs 7 & 8 in menu 2521. 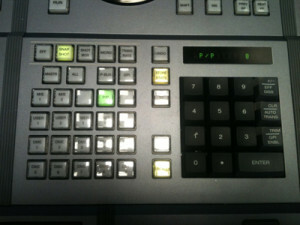 Cut on DSK3, set key3 video source as FM7, check that key is set to linear & autoselect and that FM8 is the key source or matte. 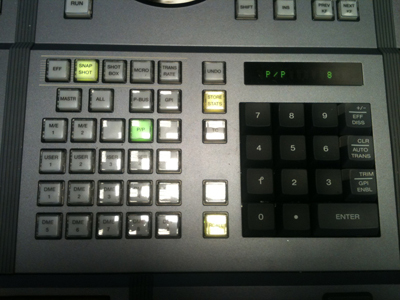 Set the next transition to be DSK2 only, set key2 video source as M/E2, check that key is set to linear & autoselect and that WHITE is the key source (if not, then split key to white). Go to menu 7321.9 and select P/P in the top right box (bank select). 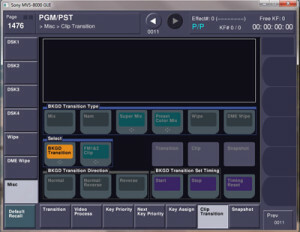 Assign FM7&8 clip trans to the Super Mix button, click Set to save. 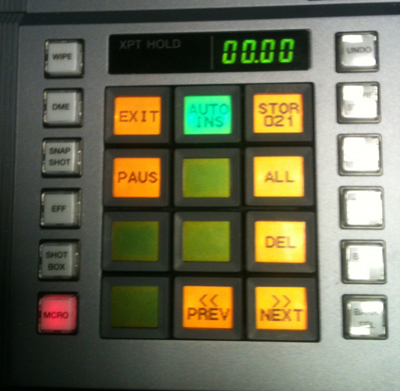 Now double-hit the super mix button on the P/P to take you directly to the clip trans menu 1476. You’ll see the clip in the top left area of the screen, with two timelines top right. 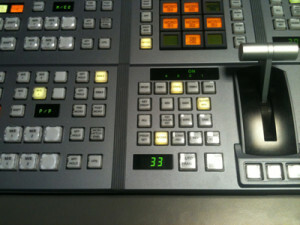 As you move the fader, the clip will run, and simultaneously the background will mix to M/E2 – i.e. DSK2 will mix on. By default, the background mix is the same duration as the clip, but it will need to be shorter. Move the fader to the frame on which you want to start the background mix, then press Start in the Background Transition Set Timing area of the menu. Move the fader to the frame where you want the background mix to finish, and set Stop. You’ll now see a shorter timeline indicating the background transition. If you just need a background cut, park the fader on the appropriate frame, press Start and then Stop – voila, a zero frame transition. If the graphic never completely fills the foreground, or the key signal is never fully white (thank you gfx artist! ), do a 3 frame background mix where the graphic is most opaque. This nearly always works visually. Now press auto trans to run the clip transition. 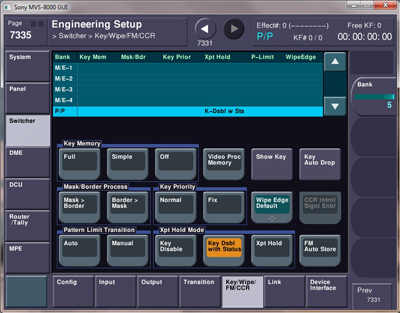 The clip is keyed on DSK3, whilst the background transition takes place on DSK2. The Clip Trans function, which is assigned to the Super Mix button, runs the clip and does the background trans as one item when I hit auto trans. So it will always transition to M/E2, using DSK2. 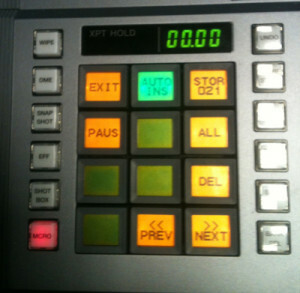 On M/E2 I can cut or mix between replays, then auto trans will transition back to the P/P bus. Save everything set up so far as a snapshot, for recall later in the macro. Store the P/P region only – in the screenshot I’ve used snapshot 8. Recall P/P snapshot 8 & check that it loads the correct clip in the frame memories, turns on DSK3, and sets all the sources on the P/P bank. Select snapshot 8 (or your choice if you’ve used another register) and click Xpt Hold button bottom left of menu.Turn Xpt Hold ON for all busses except DSK3, which remains off. There’s no need to re-save the snapshot – attributes just stay there until you modify them, or until you delete the snapshot. Now to create the macro that will recall all the above and run the clip transition, all with one keypress. First, open an empty macro register using the flexipad – in the screenshot I’ve used macro 21. Press STOR 021 to save the macro. The macro still needs some fine-tuning – I want to hit the macro each time there’s a clip transition, regardless of whether I’m going to the replay or coming back from the replay. 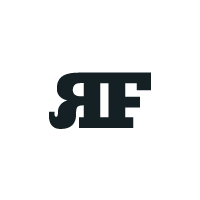 Right now, it runs perfectly the first time – i.e. going from P/P to M/E2. But when I hit the macro again to transition back to the P/P, it doesn’t work properly. This is because the snapshot recall at the start of the macro is turning off DSK2 each time. To fix this, go to menu 7335, select the P/P bank, and click the button on the bottom row called ‘Key Dsbl with Status’. This means that the xpt hold ignores the status of DSK2, and the macro works whether DSK2 starts in the on or off condition. The ‘next transition’ region is set as DSK2, and doesn’t change – i.e. to transition from camera 1 with DSK1 already on air through to the replay on M/E2, don’t select BKGD & DSK1 as next transition region – just run the macro. Similarly if you want to transition back from M/E2 to P/P with DSK1, cut DSK 1 on during the replay – it will be covered by M/E2 – then run the macro as usual.